Description: This mile of the North Fork of the Big Thompson is a spritely-moving 10- to 15- foot wide stream that runs among a mix of alders, pines and meadows on the Mountain Home Ranch. 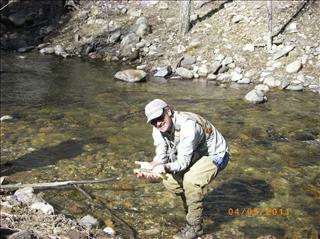 Rocky pools and runs provide excellent trout habitat for a population of wild browns and rainbows averaging 7 to 14 inches. A 2-acre pond also affords excellent fishing for larger rainbows and browns up to 22 inches. Location: The ranch, owned by the Chenoweth family, is located in the shadow of Rocky Mountain National Park near Drake (Hwy. 34-Big Thompson Canyon). At Drake you take CR 43 approximately 2 miles to the RMAC gate.